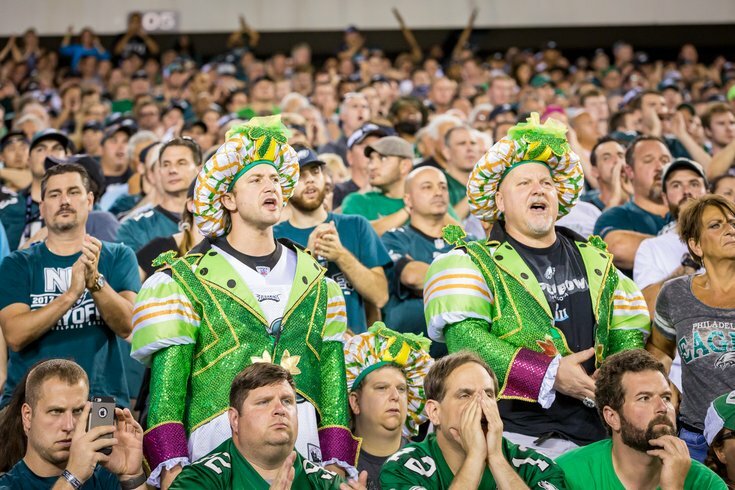 Philadelphia Eagles fans dressed as mummers during the 2018 NFL season kickoff game against the Atlanta Falcons. When September rolls around each year, it can often seem like football takes over the attention of everyone. That's especially the case here in Philadelphia, where the the local National Football League is something resembling a civic religion. "The NFL owns a day of the week," Albert Brooks says in the movie "Concussion." "The same day the church used to own." But what if you're not a believer in the church of football? It's gotten even more difficult, especially now that the Eagles are defending Super Bowl champions. Football is generally understood to have evolved from rugby as well as soccer, with certain innovations creeping into the game throughout the late 19th century. The first-ever college game was played in New Brunswick, N.J., between Rutgers and Princeton, on Nov. 6, 1869; Rutger won 6-4. The first-ever college football night game took place right here in Pennsylvania, at Mansfield University, in 1892, more than 40 years before Major League Baseball first played a night game. According to the Pro Football Hall of Fame, the first-ever pro football game was played Nov. 12, 1892, between the Allegheny Athletic Association and the Pittsburgh Athletic Club. The game met the definition of "pro" because one player on the Allegheny side – the wonderfully named William "Pudge" Heffelfinger – was paid $500 to play the game. This didn't come to light, however, until nearly 80 year later, when an accounting document surfaced that made the payment public. Football has become a much more lucrative game in the more than 100 years since. Rather than $500 per game, Jason Peters will be paid $11.2 million this year to play left tackle for the Eagles. The football is sometimes called a "pigskin," but it's not actually made of pigskin. According to Big Game Football Factory – an actual ball manufacturer that makes balls for high-level college football on down – balls were once made by inflating the bladders of animals, although that hasn't been the case since the 19th century. Nowadays, virtually all footballs for pro and college football are made from cowhide leather, although football at younger levels is often played with balls from synthetic material. As for the air inside the football, NFL rules require the football to be inflated with a gauge pressure between 12.5 and 13.5 pounds per square inch. Although, if you're Tom Brady, things are a bit more complicated than that. • In most of the world, soccer is called "football" and football is called "American football." • The Super Bowl wasn't actually called the "Super Bowl" until the fourth time it was played, in 1970; it was originally called "The AFL-NFL Championship Game." • The Philadelphia Eagles won the Super Bowl in February, for the first time in the 52-year history of the game. Why is football so popular in the Philadelphia area? This one has lots of possible answers. The origins of football, as stated above, are very heavily based in the Northeast, whether in New Jersey or Pittsburgh, Penn. Philadelphia has always been a large population center, and it got an NFL team in the 1920s, whereas, subsequent NFL expansions came much later. The Eagles also had a dominant team in the early 1960s, which was a formative time for the league. But the Eagles aren't the region's only football institution. NFL Films, the league's highly respected production arm, has long been headquartered in Mt. Laurel, N.J. The Philadelphia Soul has won several championships in the Arena Football League, a modified version of football that's played in smaller indoor arenas, and the league itself announced last month that it's relocating operations to Philadelphia. Why are Eagles fans "like that?" Philadelphia sports fans are passionate, and that's a word that can mean many different things. For background, we reached out to the anonymous area Twitter character known as @fansince09, who – when not pontificating about local sports – has been known to solve the occasional hate crime. "Eagles fans are like that because this is a city that’s too humid in the summer and too cold in the winter. It’s striking distance of New York, D.C. and Boston, but doesn’t have the prestige they do," @FanSince09 said via direct message. "Philadelphia [faced] economic hardship in the 70s and the blue collar, do-your-job and give-your-best-effort mentality persisted through our grandfathers, fathers and uncles. Philly is a generational city. You move down the street from your parents, who live across from your grandparents – we’re neighbors for life, which creates pride in where we live." "The Eagles are the representation of Philadelphia to the outside world, they’re our chance to show what we have and who we are. Unfortunately, we’ve been a city of 'almost.' We, unfortunately, have shared the division with 'America’s Team' [The Dallas Cowboys] and the ivory tower New York Giants who’ve had great success when we haven’t. But that’s different now. We’re winners and we will be treated as such. You will respect the city of Philadelphia or we will beat that respect into you." The night of the championship, what possessed those fans to knock down the Ritz Carlton awning, climb up those light poles and, in one guy's case, eat horse excrement off the street? Alcohol. Also, the cathartic celebration of an athletic triumph more than a half-century in the making, following generations of disappointment and heartbreak, leading up to the most exciting, exhilarating finish in living memory. But mostly alcohol. What's with the "Philly Special?" The Philly Special, or "Philly Philly," was a trick play, called by the Eagles late in the first half of the Super Bowl, which entailed quarterback Nick Foles – who normally throws the ball – to catch it instead. The play, which resulted in a touchdown, immediately entered local lore, emblazoned on everything from tattoos to boardwalk T-shirts. "Trick plays are among the least elegant and most exciting plays in football," author D.R. wrote in the Economist in 2015. "Although teams frequently try to confuse opposing defenses as to whether they will run or pass, more exotic forms of deception are exceedingly rare. There are good reasons for such reluctance: Because such tactics require players to demonstrate skills they were not hired for at positions they rarely play, the schemes work best when the defense expects them lease." "It just summed up who we were." So if the Philly Special is so great, why don't they just run it all the time? My eight-year-old son has been asking this regularly for the entire offseason. The answer is that the Philly Special worked because it was a surprise, and the defense wasn't expecting it. The element of surprise was part of the effectiveness. So, naturally, the Eagles ran a Philly Special-like play in their first regular season game this year. Okay, this sounds like fun. When's the next game? The Eagles play their second game of the year this Sunday, Sept. 16, at 1 p.m., against the Tampa Bay Buccaneers. They also play on Sunday at 1 p.m. on Sept. 23 against the Indianapolis Colts and again on Sept. 30, they face off against the Tennessee Titans.